My family has been in the Bay Area since the Gold Rush, which felt like a long time when I was a kid; it seems less long in the scheme of the millennia people have lived there. In school, they took us on field trips to Spanish Missions where the graveyards were full of bodies of slaves they called “Indians.” They took us on field trips to what they called a Miwok village, had us mash acorns in a mortar and drill holes in an abalone shell. Nobody ever brought up whether Native people existed in the Bay Area still. Likewise, growing up, I never heard much mention of the Philippines, even though America had also colonized the Philippines (again taking over from Spain), and even though there are so many Filipino people in California. As an adult, I traveled in the Philippines and felt thick shame realizing how little I’d been heard about our countries’ histories. Too rarely, I’ve long felt, is the the Bay Area given its due in literature, and even more rarely is it examined for its truly spectacularly racist and classist past and present. Therefore I was pleasantly surprised that both books I was reading for this round of the Tournament are deeply Bay Area books, debuts by Bay Area authors. 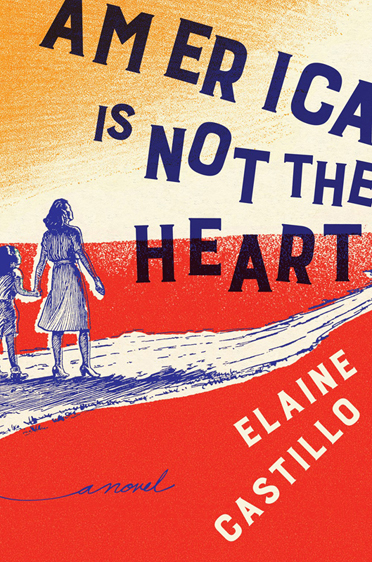 Elaine Castillo’s America Is Not the Heart focuses on Filipino immigrants in Milpitas and Tommy Orange’s There There tells the story of a group of Native people congregating for the Big Oakland Powwow. 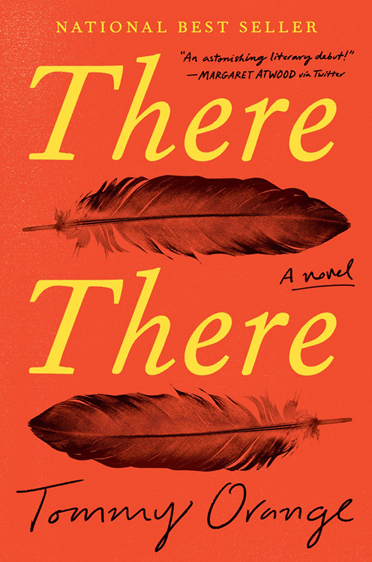 Its title is a rebuttal to Oakland-born Gertrude Stein, who famously commented about her birthplace, “there is no there there.” Reading these books, I reflected frequently upon my ignorance. I thought about how your position in a greater system can keep you from hearing certain histories, and not even realizing their absence. The narrative of America Is Not the Heart heeds mostly to Hero, so-nicknamed by her much younger cousin, Roni. (Both actually have the same family name, Geronima.) Hero arrives at her uncle’s house in the South Bay in the early 1990s having spent two years in a camp, having previously been a surgeon. Her thumbs have been intentionally broken; she’ll never practice again. Hero begins driving Roni to and from school, and in search of a faith healer for Roni’s eczema. Roni’s an original and Hero initially spends a good deal of time observing and judging her cousin (the novel’s descriptions of Roni’s physicality and dining habits were some of my favorites). Roni is also the first person who asks Hero directly about her hands (“Are you double-jointed or something? Yes, Hero said, trying to sound, easy, casual.”). Over the novel’s course, the reader feels Hero coming back to life, via new friendships and a relationship with a woman named Rosalyn, but mostly because of the fierce protectiveness she grows for Roni. I had a little trouble sticking with this book. While I enjoyed hanging out with the characters, I didn’t find myself especially gripped by any particular question of plot (whether between the characters in Milpitas, or the unfolding of Hero’s backstory). Not that I need to read for plot, and in a sense I like that the book was often less about big events and more about the mundane: descriptions of food, of the development of a sexual rapport between two people. I was also distracted by some of the formal choices. There are occasional sections written in the second person that heed to the point of view of characters other than Hero (her aunt Paz in the opener; later Rosalyn). Personally I don’t much care for the second person. I also questioned the choice to break the lull of our otherwise Hero-focused narration. I also found myself unsure about the occasional drifts the text would take into exposition, for example about the history of the colonial suppression of faith healing, often coupled with a change in style and tone. Though these were contexts I was certainly glad to have, I wondered if the author could have worked harder to boil such background into the narration. There There is also a multigenerational novel told from multiple perspectives. It oscillates between an incredible 12 narrators, all of whom are making their way to Oakland for the Powwow—albeit for various reasons. The narration for example begins focused on Tony Loneman, a 21-year-old with “the Drome” whose friends convince him to plan to rob the event with a 3D-printed white plastic gun. The sheer number of narrators gives the novel a cinematic, almost panoramic effect, especially as we pummel towards this inevitable, horrific end. There is that line from Chekhov about never putting a gun on a stage unless you intend to fire it; reading this book you know from the start, with a gulp, that that plastic gun will go off. There was an Indian head, the head of an Indian, the drawing of the head of a headdressed, long-haired Indian depicted, drawn by an unknown artist in 1939, broadcast until the 1970s to American TVs everywhere after all the shows ran out. It’s called the Indian Head test pattern. If you left the TV on, you’d hear a tone at 440 hertz—the tone used to tune instruments—and you’d see that Indian, surrounded by circles that looked like sights through riflescopes. The use of 12 narrators is an example of this book’s ambition; despite the challenge the author gave himself, its execution was in so many ways tremendous, each character, so richly drawn. Particularly memorable was the first we meet, Tony Loneman (“My eyes droop like I’m fucked up, like I’m high, and my mouth hangs open all the time. There’s too much space between each of the parts of my face—eyes, nose, mouth, spread out like a drunk slapped it on reaching for another drink. People look at me then look away when they see I see them see me. That’s the Drome too. My power and curse.”). I also was riveted by the backstory of Opal Viola Victoria Bear Shield and Jacque Red Feather, whose mother moved them to Alcatraz with her during the Native occupation of the island back in the ‘60s. (As a Bay Area history nerd, I was gratified to see the event portrayed in a work of literature.) 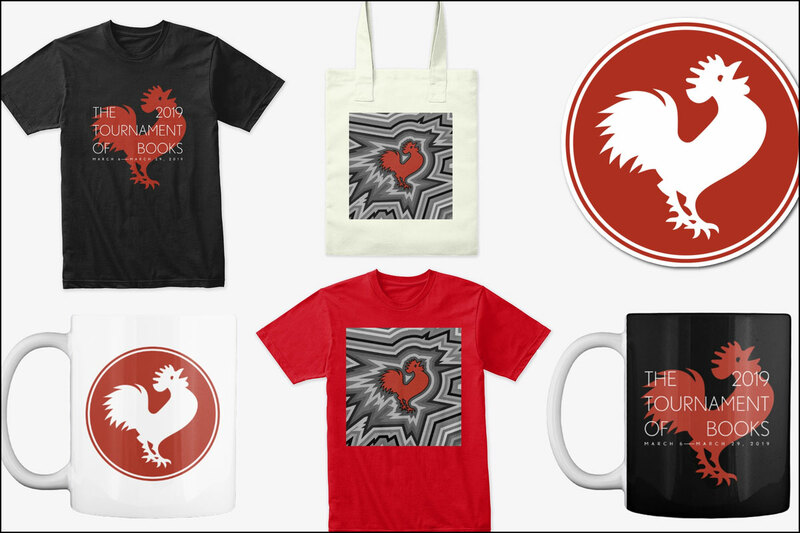 Each of the book’s threads took on a subtly different style, each felt its own, and yet each was also part of a greater whole. The novel as a whole aspired to not merely tell a story, but to say something. To state clearly what is there. I read this book so fast and as it progressed I only increased my pace. I admit for this reason I lost track a bit of the threads toward the end, but I couldn’t decelerate either. I also wondered if this wasn’t what Orange wanted. Eventually the novel released me. I grasped it and thought about a phrase like “great American novel,” which has always seemed a bit silly. If such a thing exists, this may be it. So I admit that this really wasn’t much of a contest. One of these books was perfectly well done, but the other was such an elevation of the form. Kevin Guilfoile: Hi all. No official commentary today (although we’ll have more to say about There There in the quarterfinals). But I wanted to drop in to provide our first Zombie Round update. 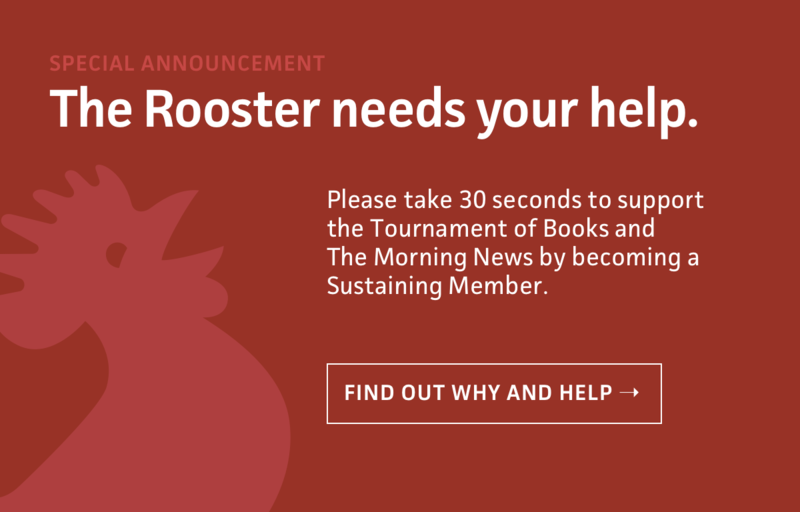 As you regulars know, before the tourney began we asked readers to vote for their favorite books from the shortlist. We have compiled those ballots and locked the results away in a hidden, fortified bunker, the location of which is known only to the author Dan Mallory (and just try to get a straight answer out of him). Starting today, after each match, we will get an update on which books from those so far eliminated are the current leaders in Zombie voting. As more novels get bumped from the competition, these results may change. When we whittle the list down to just two, that pair will face off against the final Zombie-vote leaders for a spot in the ToB Championship. So a crow has been dispatched from the secret underground location and I unfurl the raven scroll to see that if the Zombie Round were held today, our White-Walking Works of Fiction would be in no particular order (OK, alphabetical) My Sister, the Serial Killer and Washington Black. Two of my faves as it happens. A coincidence, I assure you. Sadly that means we say goodbye to A Terrible Country, America Is Not the Heart, Call Me Zebra, Census, So Lucky, Speak No Evil, The Italian Teacher, and The Parking Lot Attendant. Those novels are officially out of competition. John and I will be back in the booth tomorrow as Anna Burns’s Milkman takes on Michael Ondaatje’s Warlight, with Avital Chizhik-Goldschmidt in the RBG robes. Milkman versus Warlight. It is so satisfying to me when the titles have the same number of syllables like that.